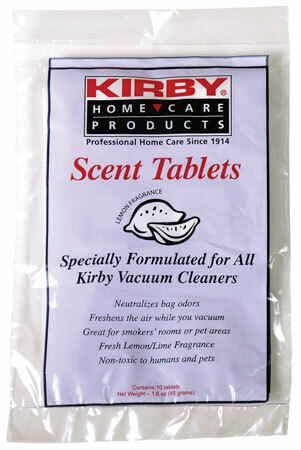 Want the disposable bag on your Kirby home care system cleaner to smells fresh until it's time to change it? Or a room that smells clean? Our Scent Tabs will help do the trick. These compact wafers of sweet fragrance are so easy to use that you forget about them Â– until you vacuum. A clean fresh smell emanates throughout the room. They're Scent-sational! Drop a Scent Tab into the outer cloth bag on your Kirby home care system. That's all there is to it. When you vacuum, the airflow releases fragrance from the tab. Drop in a new tab when you replace your disposable bag. While the tablets are convenient the deodorizing drops left a better sent and last longer.